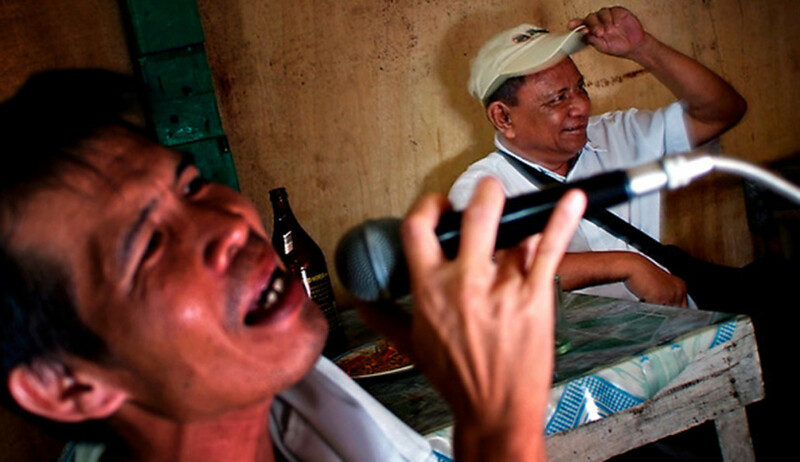 It’s Chapter Six of Brian’s Karaoke World Tour and this time I’m in the Philippines. I was in Manila ‘couch surfing’ for my book Sleeping Around when my host suggested that we do what all good Filipinos do. Go to karaoke. We went to a small karaoke bar and when I told Jude that I was going to sing ‘My Way’ he said, ‘You can’t sing that. You’ll get killed!’ Only the week before a man had been shot dead in a karaoke bar for singing My Way. He was halfway through the song when the bar’s security guard yelled at him for singing out of tune. He ignored him and kept singing, so the guard pulled out a thirty-eight-calibre pistol and shot him dead. His defence was that it was his favourite song and he didn’t like the way he was singing it. It makes ‘and now the end is near’ rather prophetic, doesn’t it? Apparently violence is common in Filipino karaoke bars and My Way is the most frequent cause of fights and deaths. A few months earlier another man had been killed and his friend seriously wounded when they sarcastically applauded a student who was singing My Way off-key. The student felt insulted, so when they left the karaoke parlour, he ambushed and shot them. ‘So what song did you pick?’ Jude asked as I handed my song request to the waitress. I thought I’d give it a go. I actually won a karaoke competition once singing the song—okay, most of the other contestants were drunk, but that’s not the point. Besides, the large group of drunk Korean guys looked friendly enough. There was only one tiny thing that worried me. The security guard at the door was brandishing a rather large shotgun and was wearing a fully loaded ammo belt. There was no one in the second karaoke bar to shoot me. Unless Jude suddenly decided he didn’t like my singing. We were the only patrons. The hosts of ‘Let’s Have Fun’ karaoke bar were definitely full of gayness. Two transvestites—who had lovely long, shapely legs I have to say—were hosting it. Their place was one of many large outdoor karaoke bars on the waterfront promenade. Because of the holiday they were all busy, but we stopped at the largest, which would have had more than a hundred people in the crowd. I put my name down and had only taken a sip of my beer when ‘Miss Diva’ called me up onto the stage. ‘Where are you from?’ Miss Diva purred. When I told her the two leggy transvestites hopped around the stage impersonating kangaroos. ‘So, what song would you like to do?’ Miss Diva asked when she’d finished her hopping. ‘My Way,’ I said brightly. There was a loud ‘Ohh’ from the crowd. ‘You’ll get shot!’ Miss Diva said gravely. ‘See, it’s safe,’ I said when no hands were raised. Our last karaoke bar was a midget bar. The bar itself wasn’t small, but all the staff were midgets—or dwarves, or little people, or vertically challenged folk or whatever is PC and accepted in polite company nowadays. Although the bar was called Hobbit House, Jude didn’t tell me about the bar’s unique staffing prerequisites and I got quite a shock when someone down at my knees asked if I wanted a drink. We grabbed a table and when our waiter returned with our drinks, little hands came up and plopped them on the table. The bar may have been run by small people, but they had big prices. Our beer cost three times as much as in the last karaoke bar. I also noticed that they didn’t have Randy Newman’s ‘Short People’ on the song list. ‘How do you say cheers in Dwarfish?’ Jude asked, after I’d got through my fourth and final version of My Way for the night without a single shot being fired in anger. Karaoke World Tour – England Karaoke World Tour – Switzerland.